Skoltech | Chronicles of Mars: a dead planet or new home for humanity? Today, robots are the only dwellers on Mars, but whether the planet was inhabited in the distant past remains a mystery even after dozens of missions. Will the new data captured by Mars rovers and orbital vehicles help to unlock the secrets of the red planet? 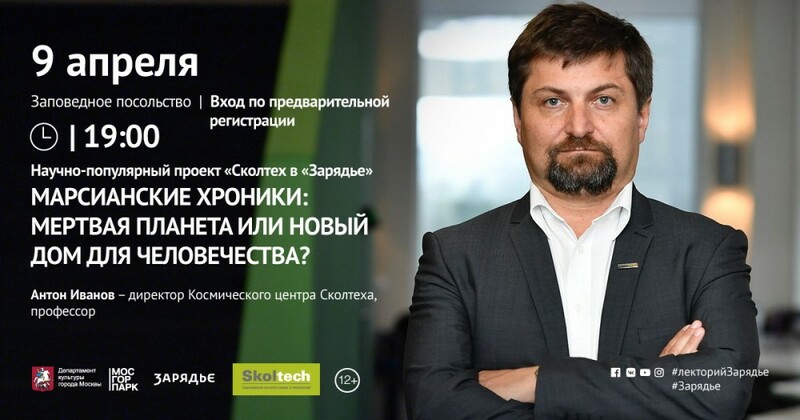 To get answers to these questions, join the lecture by Skoltech Space Center director Anton Ivanov, who will talk about how Mars has been explored and how our understanding of the planet has altered over the years and why Mars is often touted as a potential solution for the survival of humanity. The lecture is intended both for a broad audience interested in the latest scientific advances and those fascinated by astronomy and wondering if we are the only civilization in the Universe. Professor Anton Ivanov is a graduate of the Moscow Engineering Physics Institute (MEPhI) and director of the Skoltech Space Center. In 2000, he received a PhD degree in Planetology from the California Institute of Technology (Caltech). He worked at the NASA Jet Propulsion Laboratory (NASA JPL), where he was involved in a series of projects, such as Mars Global Surveyor, Mars Odyssey, Mars Express, and Mars Science Laboratory, and conducted research at the Space Center of the Swiss Federal Institute of Technology in Lausanne (EPFL). Anton participated in CubETH and Astrocast projects and was in charge of the CHEOPS satellite conceptual design. The Skoltech laboratory that Anton directs specializes in strategic new-generation space system projects. The lecture will be given in Russian at Zaryadye Park Lecture Center on April 9, 2019 at 7 p.m.